Fifteen years ago I listened for the first time to a two-CD compilation of Swedish folk music entitled Årsringar. Most of the Swedish folk music I had heard previously was very traditional, played on one, two, or three fiddles, usually with relatively fixed harmony parts. The wide-ranging Årsringar collection presented quite a different picture. It covered the evolution of Swedish folk music between 1970 and 1990, a twenty-year period of great discovery and creativity. Its styles ranged from unaccompanied tunes played on fiddle, bagpipe, or whistle in the older styles to wild and newly composed pieces played by ensembles of percussion, horns, electric guitars, and synthesizers. The recording opened with a beautiful tune called “Fastän” played by a band called Groupa, with an enthralling arrangement of fiddle, flute, cornet, and bass clarinet. Though newly written, the tune sounded very Swedish, and the arrangement and instrumentation were innovative and captivating. There was a second very different and more traditional tune by Groupa on the same collection. Impressed with their music and curious to hear more, I bought a couple of their recordings and was hooked. While all Groupa’s musicians were excellent, the player whose music held me most was Mats Edén. In addition to playing fiddle, button accordion, and something called a drone fiddle, Mats also composed several beautiful tunes on each Groupa recording. In the ensuing years I have come to appreciate Mats Edén as one of Sweden’s greatest folk musicians, a multi-faceted player and composer deeply rooted in tradition, yet brimming with new ideas and possibilities. In both his traditional and contemporary music you will find a wide variety of musical modes, rhythms, and emotions. His tunes can be both melancholy and joyous, pensive and uplifting, startling and soothing. They can paint a picture of his favorite places, or make you want to dance, cry, or sit and wonder. But they usually make you feel good. 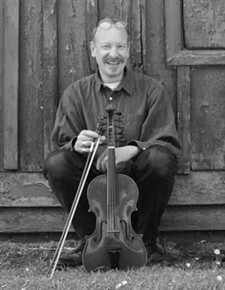 In addition to accordion and a standard violin, Mats plays a unique instrument he calls a bordunfiol, or drone fiddle. This instrument was inspired by Norwegian Hardanger fiddles and sympathetic string fiddles developed by Anders Rosén and others in Sweden. Mats’ bordunfiol, made by Anders Norrude, a well-known musician and maker of fine and unusual instruments, has a viola body with the scale length of a standard violin. The five playing strings and five sympathetic strings can be tuned in various ways to suit each piece of music. I interviewed Mats at his home in Harlösa, a small village east of Lund in southern Sweden. I heard that your first musical influence was your stepfather, Sven Edén. Did your early repertoire come mostly from what you were exposed to by him at home? Yes. But then also I had some friends, you know, my first fiddle mates. We all met in the same summer camp in 1971. Leif Stinnerbom, Ulf Jonsson, Bo Thalén, Mats Berglund, Lars Warnstad. But then after a while, the repertoire my father was playing, you know, it was a bit boring and so I was more fond of playing music from Dalarna. I listened to Björn Ståbi, Pers Hans Olsson, and Thore Härdelin. And then Anders Rosén and Kalle Almlöf came with this groundbreaking record called Västerdalton. They played with scordatura, you know, A bass, and drone fiddling, and different tunings, and the sound of the music was fantastic. So that was the repertoire I liked to play. Can you describe how the Värmland style is different from the Dalarna style? Well, the music from the east and northeast of Värmland is kind of the same as the west of Dalarna. It is not really the same as Rättvik [style]. There is a slight difference. Because there have been a lot of contacts. The fiddle players didn’t bother with borders, there was just woods there, you know, and moose, so they cross over. So you can find tunes from the western part of Sweden, actually, from many places, that are very similar. If you generalize, one style is western style, one style is eastern style, one is south…. So the style of the region that is closest to Norway is more like Norwegian music? You sought out a lot of older fiddlers in Värmland. What was it like to learn from them? It was a thrill. At that time Leif (Stinnerbom) and I lived together, and we went out [to look for older fiddlers] and sometimes we had luck, sometimes not. Sometimes we went to a little local grocery store and said “Hey, do you know some fiddle players, some musicians here?” “Yeah, these guys here.” And “Oh, I have not played for many years, I can’t play anything, but you can go to that guy.” And so it was. Then we came home with the tape recorder, and as I was more skilled in writing down the music, I would do that. Leif was asking the questions, I made the music notes, and Inger [Stinnerbom] made the notes because she had better handwriting than me. We got a good understanding what the music was for the people. It was dance music for them. Did you feel like you got a better sense of the musical heritage of your area by learning from all these fiddlers? Yeah, in a way, yes. And also you understand [how they learned tunes]. For example, Oskar [Andersson] played one tune, or his friend Alfred [Magnusson], who was born eight years earlier in 1890. We would ask “So what is this tune?” “Oh, it’s an old Norwegian tune that we learned from 78s.” So a lot of [fiddlers], they have a need for new tunes, so when they bought a new record they all learned it, you know, because it was a new tune. Whatever. Records, or “this is an old tune I learned from my father” or “this is a lyric from the very popular songwriter from the 1930s” and whatever, you know? In one way, Oskar was very observant how he played the melodies, in phrasing. Not exactly, we didn’t need to play exactly [his way]. But expression was important. To express yourself. He said that you have to express yourself, you know. If you just play the melody it is boring. Would he correct you if you were playing for him, or suggest things? Photo above by Thomas Ringdahl.